Description on my sample: Hypoallergenic, paraben free, perfect primer. Natural mineral sun-care. SPF30. COOLA has perfected the art of blending organic and natural ingredients. Zinc and titanium dioxide are evenly dispersed to maximize coverage and to minimize white residue. 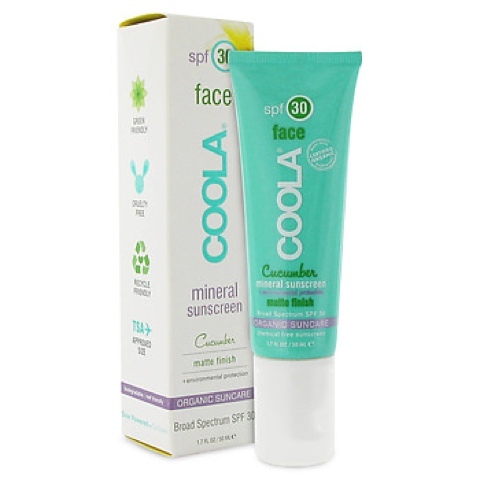 COOLA natural mineral SPF formulas provide superior sun protection with a transparent application. Enjoy! My thoughts on this product sample from my Glymm Box, I didn't know you had to shake the product before you used it as my sample was separated. Not knowing any better I used the top layer of this sunblock on my face and had a chalky white film on my face. The separated layer of product had a smooth mousse like consistency. It dried quickly and blended well. Only the fact is my skin is a lot darker than this pale white sunblock. Hence it leaves a white veil over my skin which looks rather odd. Also the matte finish dried out my skin, which wasn't too pleasant. Overall, I don't think I would purchase this product in the full size version. But I might want to try a sample of the tinted sunblock just to compare the two. My score for this product is 1 out of 5.